Silicon Valley technology from FitBit to Facebook has made its way into our lives, yet opening the doors to Silicon Valley is still a big unknown for a lot of NZ companies. Where do you start? Is there an information booth where you can schedule your meeting with Mark Zuckerberg and Larry Page? Nope. Arriving in the SF Bay Area for the first time and heading down the 101 can seem a bit meh, it looks like typical American suburbia. 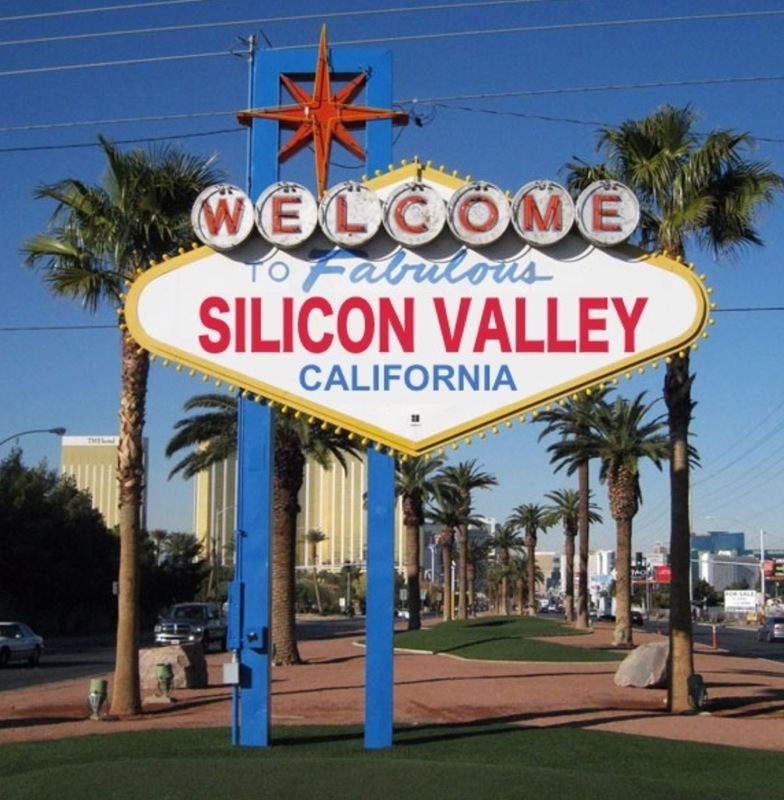 Where is the hi-tech utopia with the flashing lights and all the buzz of the Las Vegas strip? There is no information booth, not even a “Welcome-to-Silicon-Valley” sign on the Freeway (sadly the image above is a crudely photoshopped version of the famous Las Vegas sign). In fact they couldn’t be more different. In Las Vegas, whether the next quarter you place into the slot machine will be the winner will be determined by lady luck. In Silicon Valley it is about who you know that could make the difference between success and failure. “If you need a friend, get a dog.” Because in Silicon Valley, dogs have hotels, they go to work with their owners, and generally are great social initiators to get you talking to other people in parks. You’re just as likely to meet someone that can help you while you’re walking your dog as you are giving up five to ten percent [of your company] to tech mentors who order in lunch everyday and wave their hands in front of PowerPoint presentations. Adapt and survive. Recognize that you need to adapt to the Silicon Valley way of doing business. You will spend a significant amount of time pitching. Catching up for a coffee is considered a business meeting and most initial meetings will be less than 30 minutes. If you can’t communicate your business and value proposition in less than 10 minutes, you are not ready for Silicon Valley. Research. Do your research and this is especially important if you are looking to raise investment. Determine which VC’s are more likely to be interested in your technology or company. What VC’s have invested in a similar space, what companies do they currently have in their investment portfolio, do they invest in off shore companies? Aside from cash, what expertise or networks can they provide to help you accelerate? Talk to companies they have invested in – have they helped or hindered? What are their terms like? Stay until you finish. Closing any deal – investment or sales, takes a lot longer in Silicon Valley than it typically does in NZ. Having a “good feeling” at the end of a meeting and then jumping on a plane back to NZ and celebrating is very naive. A deal is not done until the paper work is complete and the bigger the deal, the bigger the amounts of paper work. Most start-ups here have attorneys and they play a significant role – at the beginning of the business and most lucratively at the end. Follow up Quickly. One of the great things about coming from NZ is that you always know someone who knows someone. So find that someone and ask for an introduction. Follow up with an email outlining next steps and do this as soon as possible after the meeting. If you received the introduction through someone, then always include your contact on this email. If the meeting went badly, send an email and thank them for their time. Silicon Valley is a series of interconnections and you will undoubtedly come across this person again. Even if you didn’t make a business connection, you can still leave a good impression. Work Life Balance. People in Silicon Valley work hard, really hard and they don’t want to hear your views on lifestyle or work/life balance. They don’t want to fund your ideal lifestyle – they want to fund a good idea that has the potential of providing a significant return on their investment, and they want to know you’re working day and night to make it happen. These are pretty simple recommendations, but getting the basics right is incredibly important in Silicon Valley.